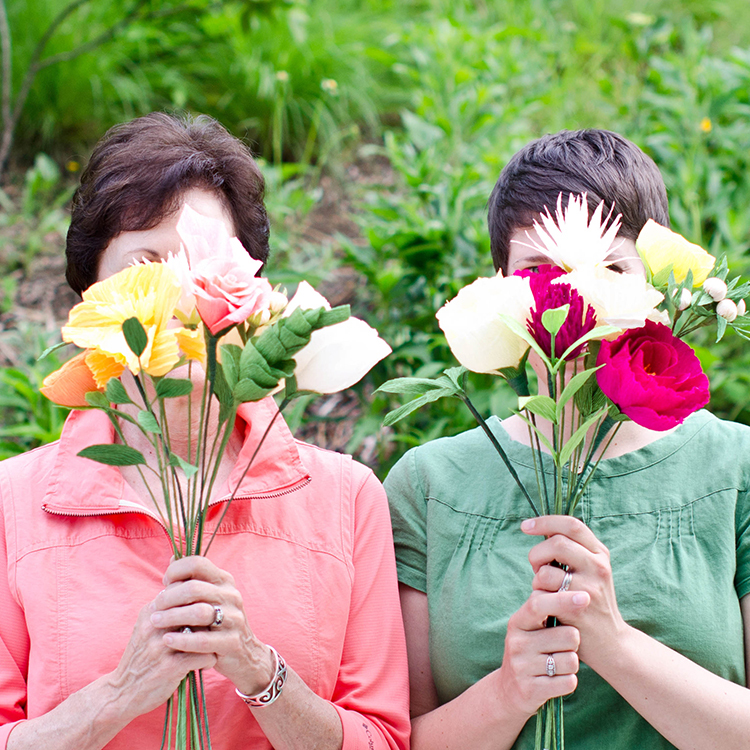 Meet Cherie and Meredith Eastburn, the mother-daughter duo behind Amaranthus Paper & Flora. 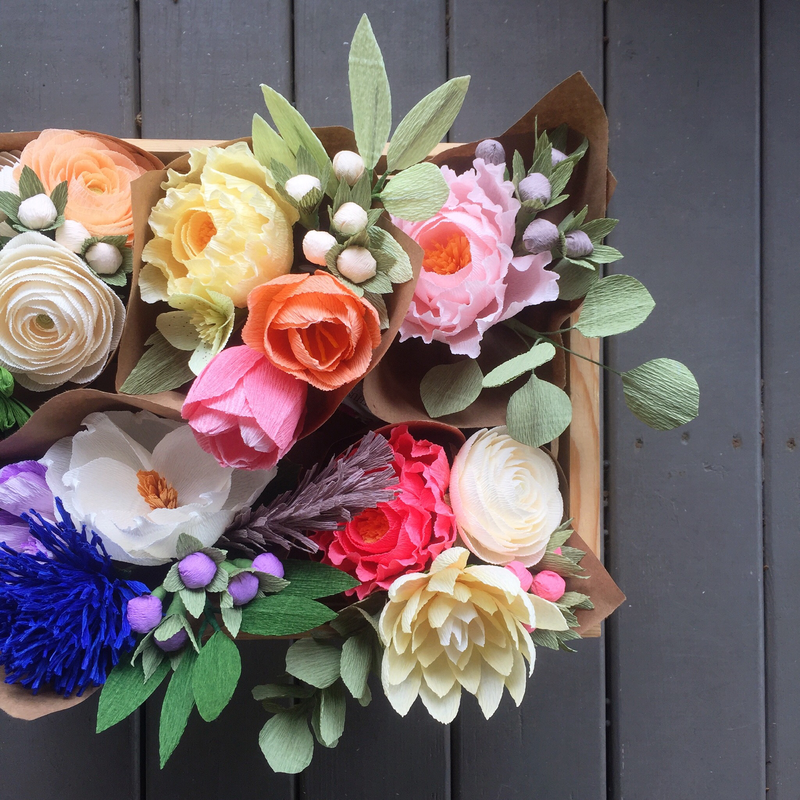 They work together and sell their blooms and bouquets online and at occasional pop-ups and markets. In the language of flowers, “amaranth” signifies immortality — an apt name for a business whose creations never die. This talented duo is such an inspiration to us… In an interview, Meredith shared some insight into their work. LG: You both work together. How did that come about? ME: My mom started making paper flowers first, almost four years ago. She was helping her sister who runs a nonprofit pediatric oncology camp in Delaware. Kay’s Kamp is the legacy of my cousin, Kaylyn who lost a brave battle against leukemia at age eighteen. For the organization’s annual benefit gala, my mom had been creating live floral centerpieces, which was logistically tricky as a long-distance volunteer. 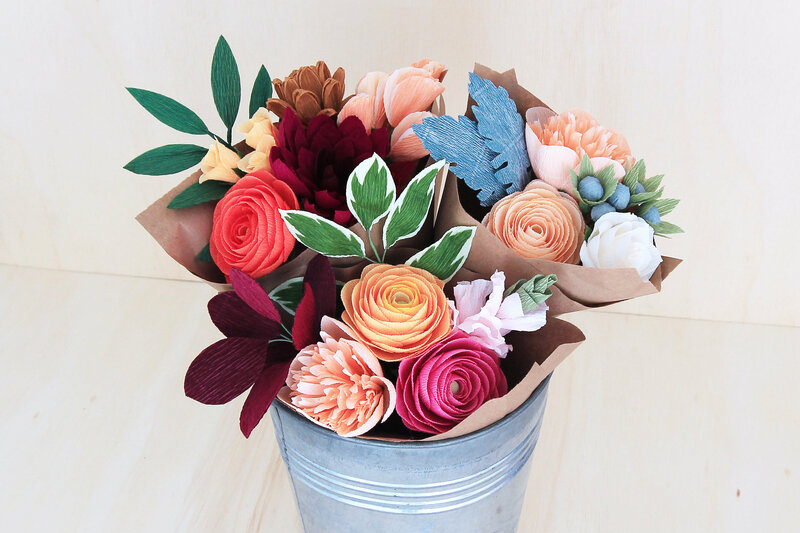 So she started experimenting with paper flowers and taught herself how to work with crepe paper. 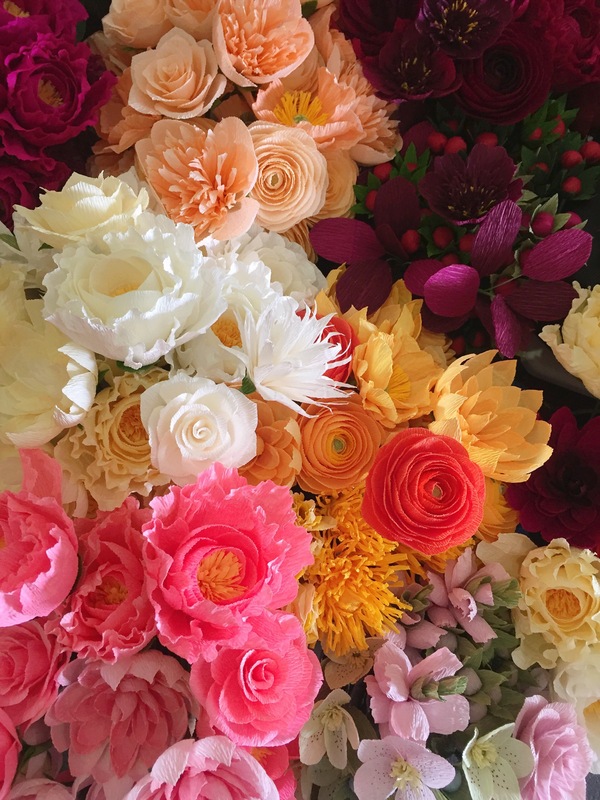 Mom made nearly a thousand blooms and we arranged them with live greenery for the centerpieces. Guests loved them so much that I convinced her that we could turn this into a business. 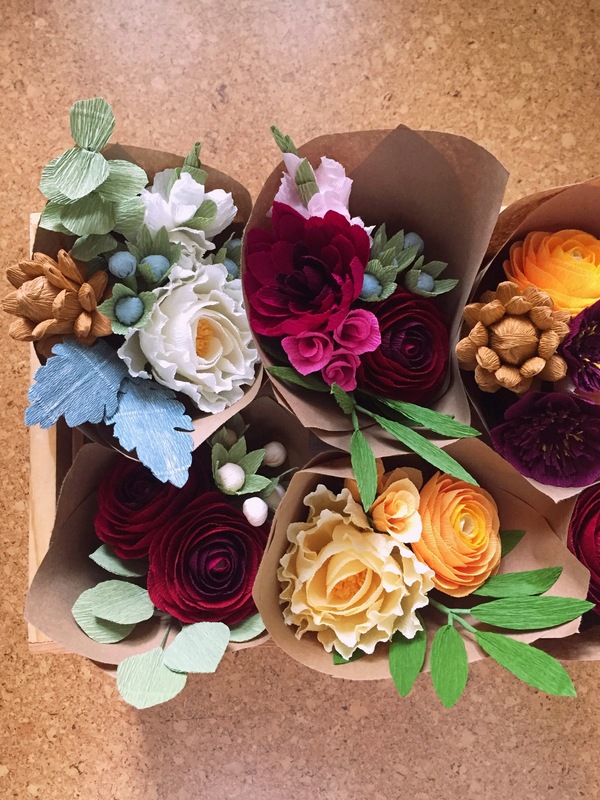 We launched Amaranthus Paper Flora in early 2014. ME: We taught ourselves through experimenting and trial and error. We examined live blooms and man-made stems, playing with various types of paper and other materials. We loved the sculptural qualities of crepe paper the most and that’s what we use for our designs today. LG: What is it about one another that inspires you most? 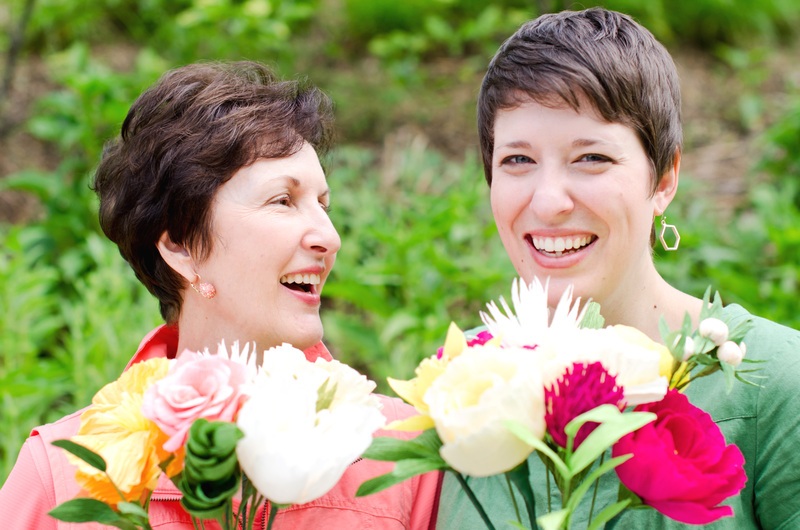 ME: I feel lucky to work so closely with my mom. I’m in total awe of her work ethic and it makes me work harder. That said, we have a rule between us that we’re not going to do this unless we’re having fun. My mom would say that she’s not creative, that I’m the “color” person, but that’s just not true. She has really embraced the process of exploring the medium and is always coming up with new ideas to try. 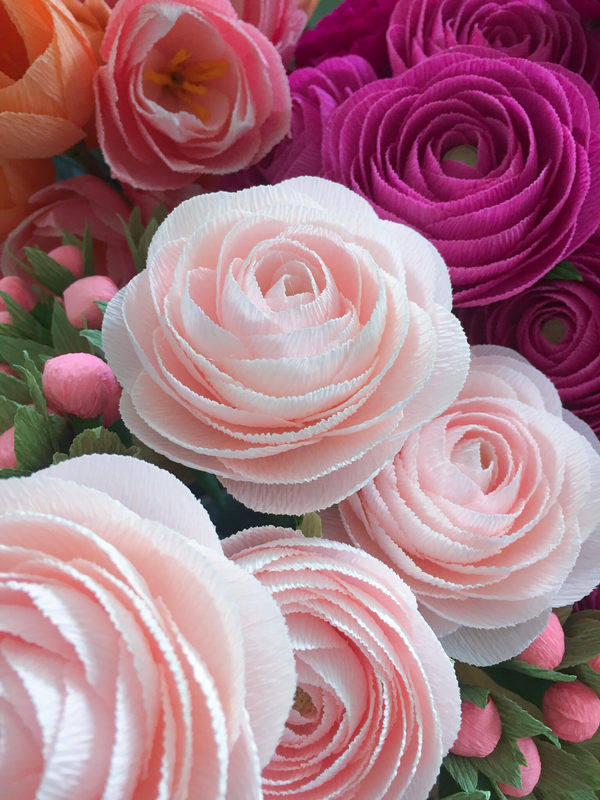 LG: What do you love most about making paper flowers together? ME: Actually, until this summer when I moved to Atlanta from Lexington, KY, we have coordinated our business from two different states. Thank goodness for Google Docs and Facetime. Mom and I both have a studio (the room where it looks like a flower bomb exploded) in our respective homes, and now we can meet at least once a week to work or brainstorm in person. ME: My mom’s first blooms were “fantasy” flowers, as she likes to refer to them, where she randomly combined colors, petal shapes and styles. 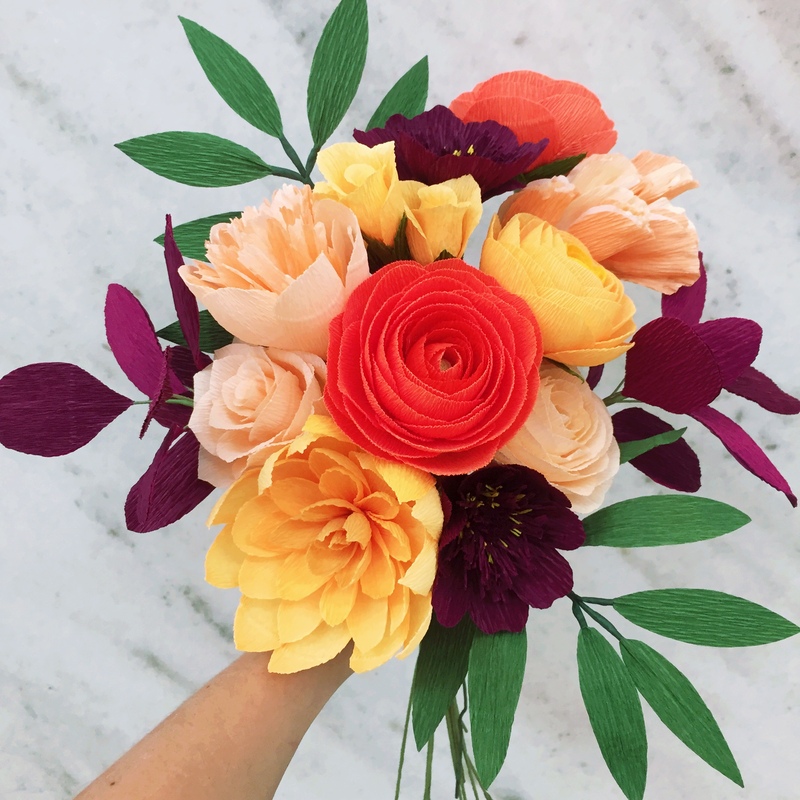 When we decided to start Amaranthus, I felt our blooms needed to more closely resemble those in nature. Our style has evolved and we’re like to describe our flowers as inspired by nature — but not bound by realism. ME: Having enough time to do everything (fulfilling orders, marketing, experimenting on new work, etc.) probably challenges us more than anything else. Plus cuts from scissors and burns from glue guns! ME: Mom and I specialize in crepe paper and prefer to use high quality, heavy weight floral crepe for its strength. We use lighter weight crepes and doublettes (including the lovely options from Lia Griffith) to expand the range of colors we blend into our Signature and Seasonal Collections, and for custom pieces. 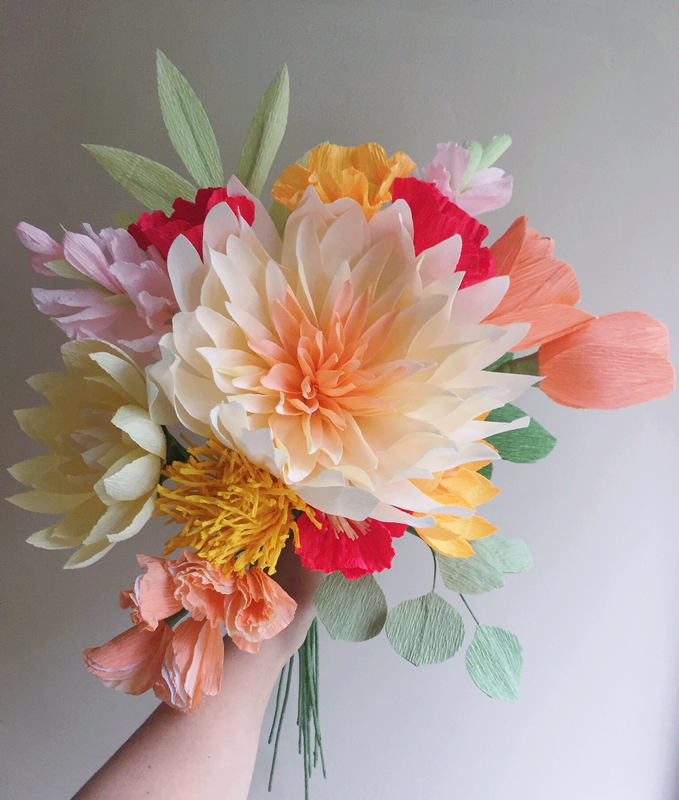 ME: Making paper flowers takes a lot of practice and patience. It is time consuming, but don’t rush it. Give yourself time and permission to enjoy the process. Try a technique at least three times in a row to learn from the nuances in the material and refine your cutting/sculpting motions. ME: Essentials are good lighting, a low temp glue gun (we buy ones that stand up on their own — it makes a huge difference! ), and sharp scissors in various sizes. We use 18-gauge wire for the majority of our stems. Tweezers, cotton balls and wood skewers also come in handy. ME: Be sure to order sufficient quantities of paper for your entire project all at one time. As with any material, color dye lots can vary from swatches and with each shipment. It can be so disappointing and frustrating to not have enough paper on hand to finish a project. Most importantly, don’t compare your work with someone else’s blooms. 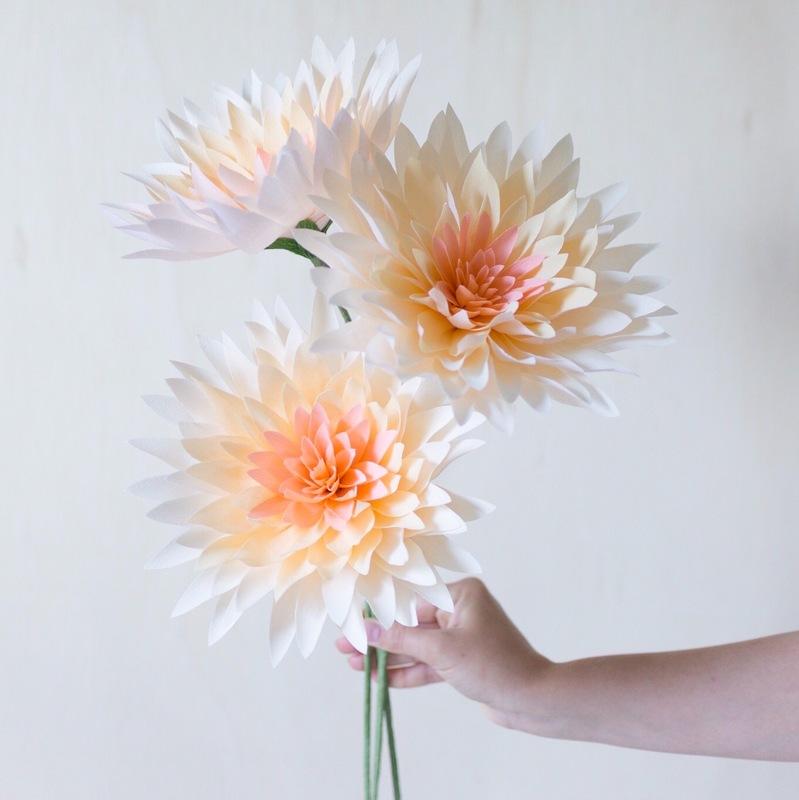 Each paper flower is beautiful in its own way, just as every real flower is. 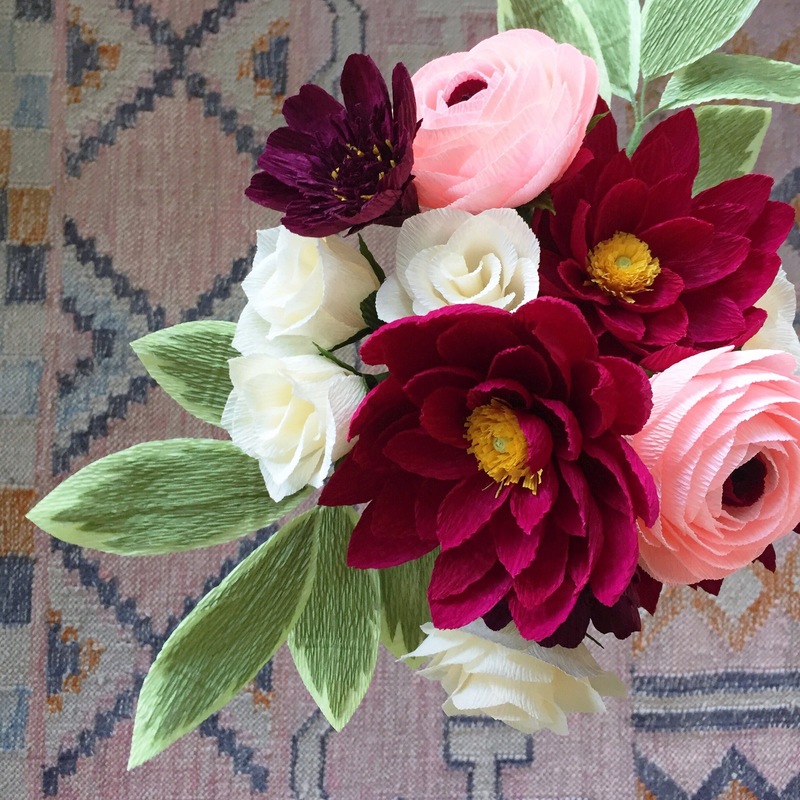 Check out some of Meredith and Cherie’s creations below. Join them on Instagram and browse their website here — papercut paradise awaits you!